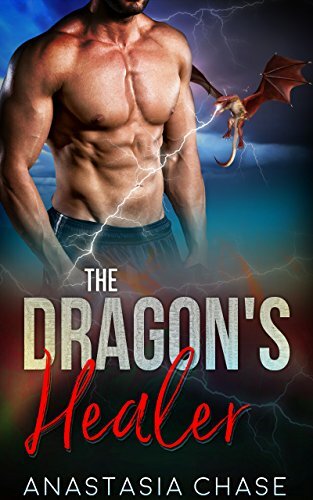 The Dragon’s Healer by Anastasia Chase. Evette Summers is 38 years old and suffering from MS but has so far refused to use modern medicine to treat her symptoms. Evette owns an apothecary in the Phoenix area where she has just hired a new worker. Two of her employees are leaving to go to college leaving Evette down a few people. She hired Valen over the phone and on his first day while on his way to work, he rear ends Evette where her disease affects her and Valen rushes her to the hospital where he meets her sister who has been helping to take care of Evette. Valen becomes vital to Evette as he starts to not just take care of her but also learns the ropes of working at the apothecary. But Valen has a secret that he is hiding from everyone. Valen is actually a dragon that left his home that’s been hidden away from human eyes. Valen wasn’t happy with his existence there and decided to leave and experience the world. The two start to develop feelings for each other even under the pressure of Evette’s illness. This was a cute read. The writing of the disease was decently explained (I suffer from my own undiagnosed neurological disorder) so it was easy to see. The story is told from both Evette and Valen’s point of view sharing what is going on with each. The writing is good and the story grows with the development of the characters. I liked that Evette wasn’t 20 like most characters and that she has lived her life before the book takes place. With her illness she does have emotional problems that often occur. I liked this book and will look for others by Anastasia Chase. Check out The Dragon’s Healer here.